What a month....any of you who follow my blog know that pies are my nemesis. I have tried, over the years, to overcome my frustration. I have made a few that I think are outstanding....I have also made some that weren't even recognized as a pie. It's the crust. I seem to fail transferring the crust to the pie plate. That seems like a small thing to master but one would need to practice and the frequency with which I make pies could not be considered practicing! So......when I looked at my Blogger CLUE assignment and realized that I had been assigned Heather, "Queen of Pies", at All Roads Lead to the Kitchen, and that the theme for the month of November was pies, well, I took pause. What to do? Cherry Crunch Pie was at the top of the list...fresh cherries, not happening this time of year, frozen cherries not available.....on to the next choice....Cherry Pinot Noir Pie....I am fixated on cherries. How about pizza pie? Is that a cop out? Never. Carnitas Pizza with Chipotle Avocado Crema...that's it!! Oh how delicious the carnitas were!!! But, I didn't want to make that my choice. How about Beef and Beer Pie? That pie was also delicious....even if I didn't have a pie bird and cut my fall leaves into the crust poorly.....delicious! Then, I spied lemons...a Lemon Icebox Pie...the lights flashed and I ran outside to checkout out our lemon trees. This was a super easy dessert and one that I know I will make again and again. I used graham crackers instead of Maria Cookies as I couldn't find the cookies. 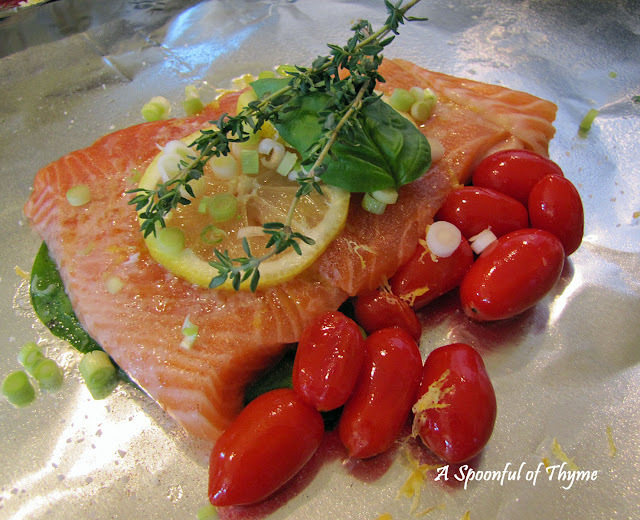 I also added some Lemon Oil and a sprinkle of lemon zest on top! 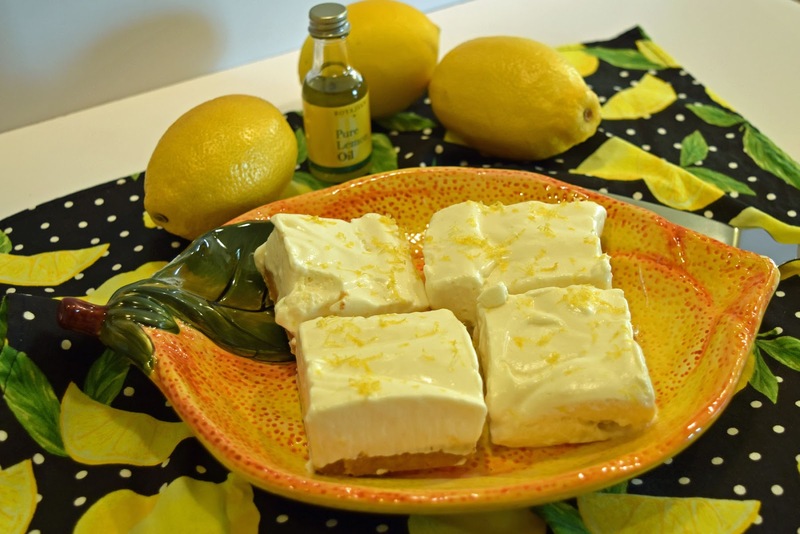 We loved the Lemon Icebox Pie as did our neighbors! Delicious. Line a 9" X 5" loaf pan with a long sheet of parchment paper and set aside. Put the cookies into the food processor with the brown sugar (Start with the lesser amount and add to adjust the sweetness to your desired preference.) Pulse until there are fine crumbs. Add the melted butter and salt. Pulse until mixed. Pour the mixture into the prepared pan and press into an even layer into the bottom. Set aside. Whip the heavy cream to stiff peaks. Add the sweetened condensed milk and whip again to incorporate. Add the lemon juice, lemon oil, and sea salt. Whip to combine. The mixture will be thick. Transfer the mixture over the crust and level the surface. Sprinkle lemon zest over the top of the pie. Cover and refrigerate until set, at least two hours. Cut into squares and serve. Heather loves food and cooking. She has so many recipes from which to choose. Perusing her blog was fun and I did make the Carnitas and the Beef and Beer Pie....both of these will be posted later this week. I will be going back to make the cherry pies. Take a look at the recipes that other group members selected. I feel your pain! I cannot do the transfer of pie crust either. And I really love the idea of pie! This looks good....and easier. 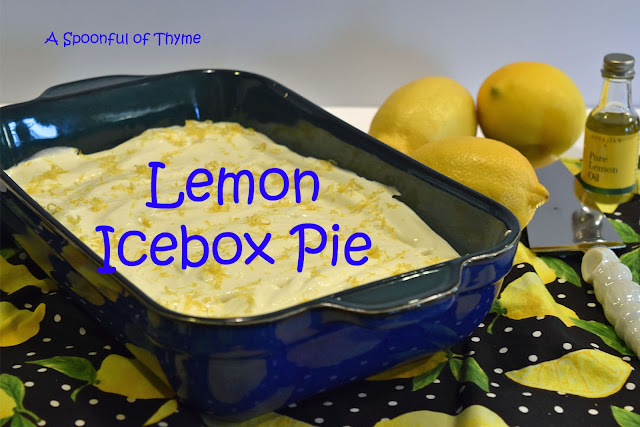 I love a good lemon pie or cake or tart or just about anything and I love this ice box pie - quick and easy! Citrus is at its peak here in north Florida during the holiday season. This rocks! Easy to prepare and delicious. Thanks. Loving icebox pie, but that lemon?? Oh my yes!! My family would love this pie! Perfect ANY time of year---but especially when the oven is busy over the holidays! What a unique pie and I adore lemon! Nice choice for this month's CLUE post! What a bright and lovely pie!! My mouth is watering at the sight. "I ran outside to check out our lemon trees" Seriously???? I am SO jealous! I'd be opening the crisper drawer to see if my lemons have turned green and fuzzy yet. I'm so glad you made this dessert. I adore anything citrus and that pie looks amazing. I have a few lemons from our tree I need to use up! Thanks! Sounds so easy and I love lemon. I have to make this one!